Q. How long do I have to watch a video from Kanopy? To checkout a film, you must press play on a film and have the film fully load and start playing. Once a play credit is logged, you will have a full 3 days (72 hours) to watch the film as many times as you would like without using another play credit, even if a new month starts and your credits reset. Your Viewing History in your User Dashboard will show any films that are still available to view in your 3 day window. After the 3 day window has expired, another play credit will be used if you press play on the film again. Please note: This information was taken from Kanopy Help on February 2, 2018. We will try to keep this up to date, but you might find more recent information from the source. Why is there a 3 day limit to watch a video? Why do we get only 6 credits? It seems like you are treating the videos like physical books/videos when they are digital ...it's a different dynamic. by Gayla on Feb 13, 2019. The borrowing limits for these items are set by the vendor. With Kanopy you get receive 5 credits a month. 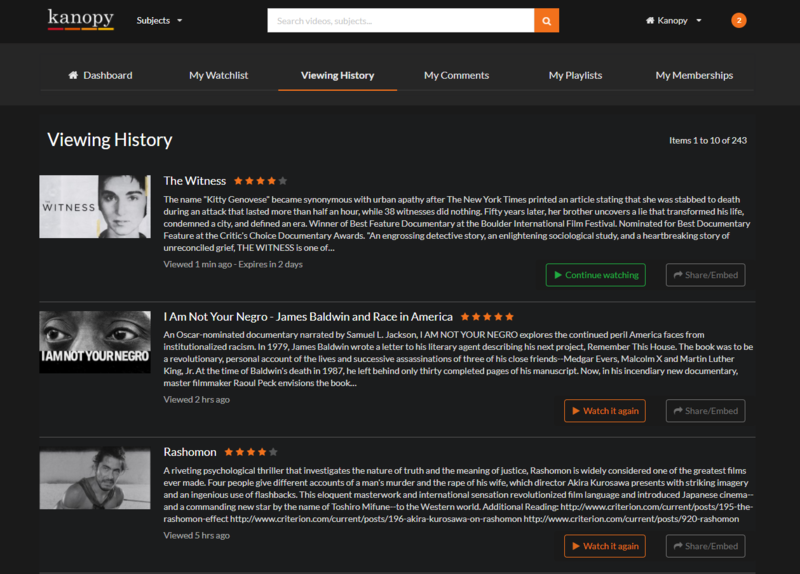 Kanopy is a pay-per-use service. Every time a library customer borrows a Kanopy item, Winnipeg Public Library is charged for its use. This differs from physical books, audiobooks, CDs, and DVD/Blu-Ray movies, where customers may borrow an individual item many times for one purchase. In order to support the sustainable delivery of Kanopy to library customers, we needed to define a maximum number of borrows per library customer per month. This number is 5. We hope this clarifies things! by Reegan - Winnipeg Public Library on Feb 19, 2019.